Gold Buyer OK address, phone, website, and more. 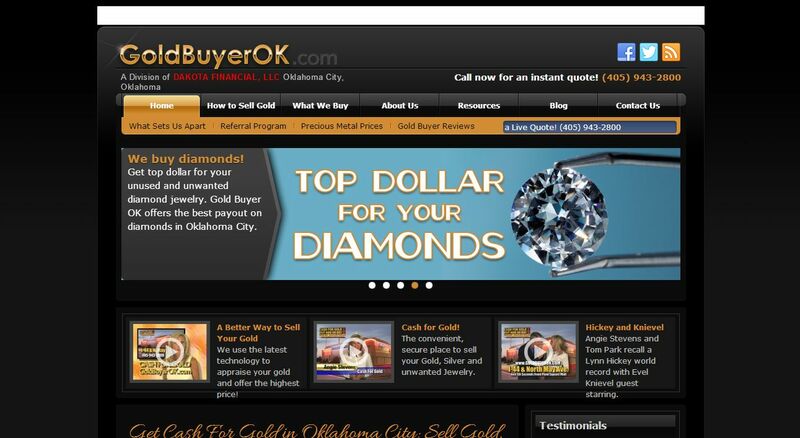 We can pay top dollar because we buy gold, silver, platinum and diamonds in Oklahoma City in VOLUME. We have always had a reputation of offering the best gold prices in Oklahoma and that continues to be the practice of Gold Buyer OK. Most gold appraisals only take about 10 minutes at Gold Buyer OK. If you wish to sell silver, platinum or gold jewelry, antiques or other items in a large quantity we welcome appointments at our OKC location. We will evaluate and appraise your gold, silver, platinum, diamonds and jewelry right in front of you. You are never obligated to accept our cash offer. You have nothing to lose and only CASH to gain! We buy gold in Oklahoma City. We buy silver in Oklahoma City. We buy platinum in Oklahoma City, and we buy diamonds and jewelry in Oklahoma City. Don’t delay — sell your precious metals for cash at Gold Buyer OK today!